After 3 hours on the road I finally arrived in Jiufen. 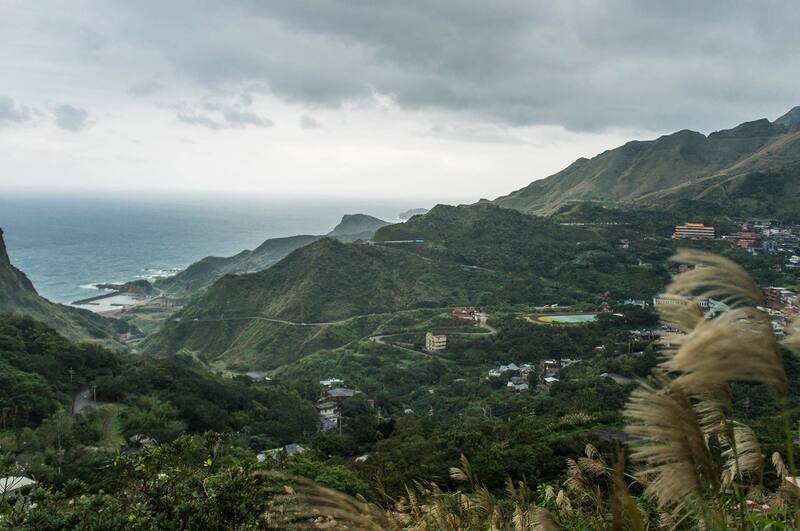 If you ever wanted to live inside the imagination of an anime creator, the first thing you should consider doing is buying a plane ticket to Taiwan. This town is well known for its gold mining history. But before the town gained popularity in this respect, Dutch and later Japanese occupiers arrived in the 15th century. Gold production didn’t start until four centuries later. When gold started flaking up from the ground, with almost every villager walking on it, gold mining in Jiufen began to gain momentum, resulting in a gold rush and rapidly developing the village into a town. 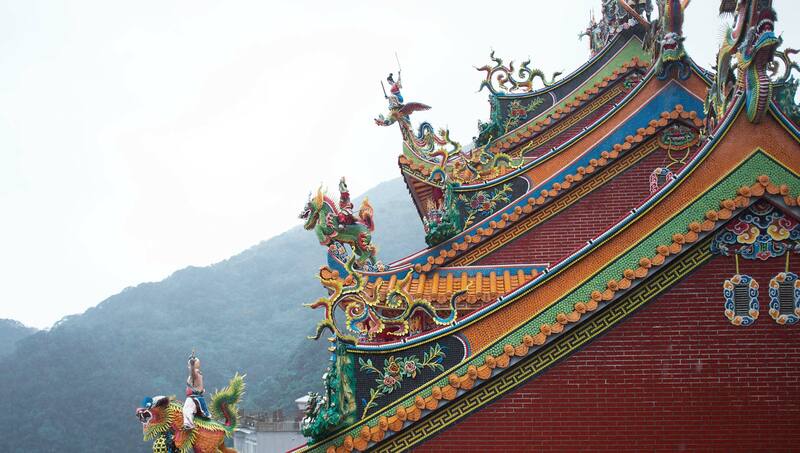 Jade buddhist temple on the hilltop, with intricate and delicately detailed sculptures. Regardless of all of the town’s success, its gold mining activities were reduced after WWII, and the mine was soon shut down. 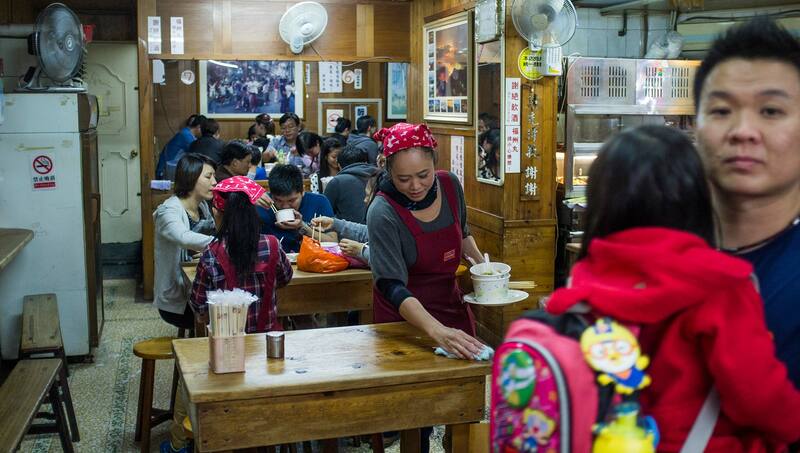 Jiufen quickly went into decline, and for a while the town was all but forgotten. Small local businesses, such as eateries and coffee shops prevented the town from becoming a ghost town. It was almost as if the prosperous old streets, buildings, mines and the town’s glamorous gold digging past were flashing in front of my eyes, slowly creating a complete picture. The old town is pretty spectacular and magical on a rainy night. 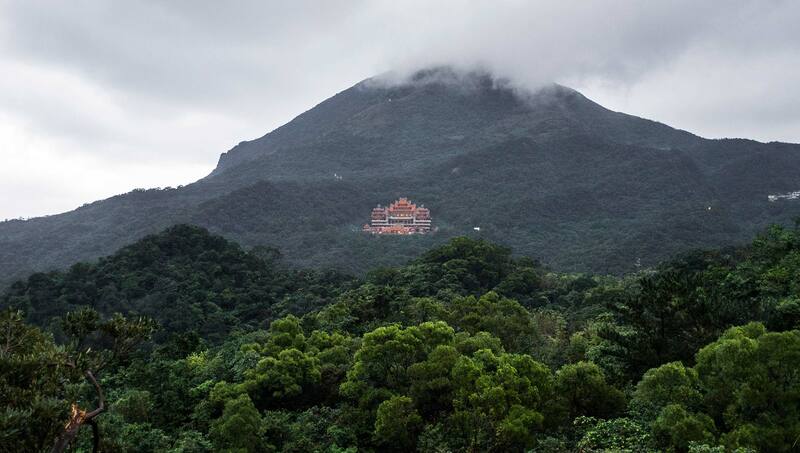 Red lanterns are lined up along the wonky, jutting out facades that crawl up the hill. The only thing that causes visual distress is the vinyl banners. 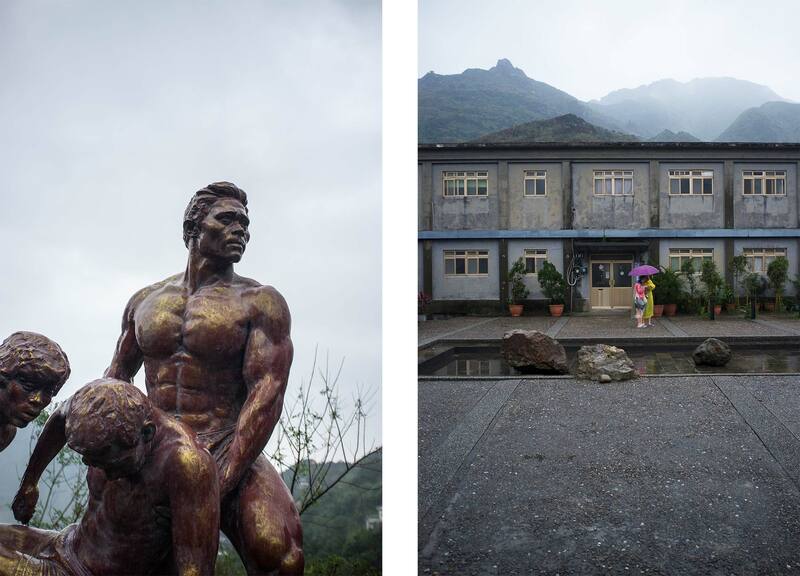 The rapid development of small villages into towns didn’t go unnoticed in Taiwan and soon Jiufen became the subject of films and a nostalgia that later influenced Japanese anime culture. The town once again became popular when its downtown area was used as a model for the anime movie Spirited Away. 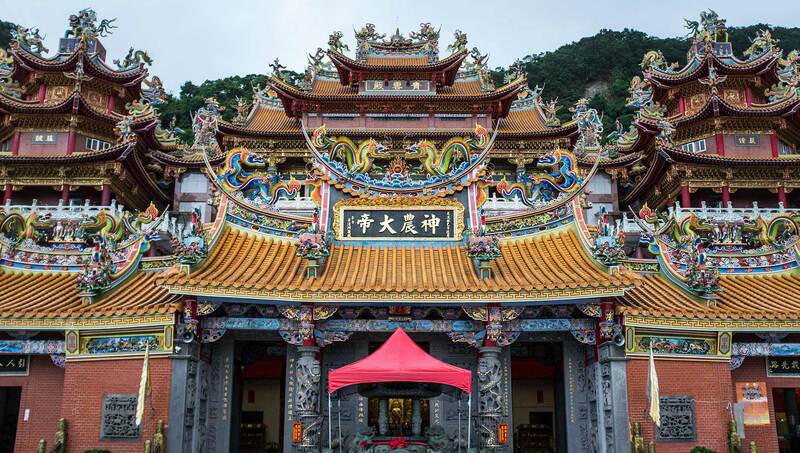 Shortly after, Jiufen attracted tonnes of Japanese and local tourists as weekend visitors, with the town becoming the number one destination for Taipeites who want to visit historical local markets and sweeping landscapes. 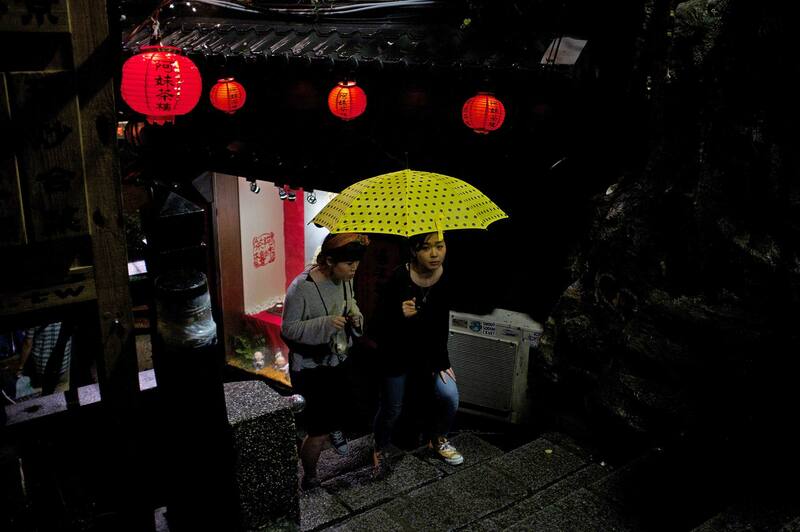 Girls under an umbrella on a rainy evening. Jiufen old street. The story behind the town’s name is also interesting. A few centuries ago this village was inhabited by only nine families. It was a pretty remote place and daily necessities were not easily accessible to the local families. One of the family members would commit to making the long trip to the town to order nine pieces of the same item, one for each family. Ordering the same thing nine times became a habit and eventually gave the village it’s name, Jiufen, which means “nine portions”. 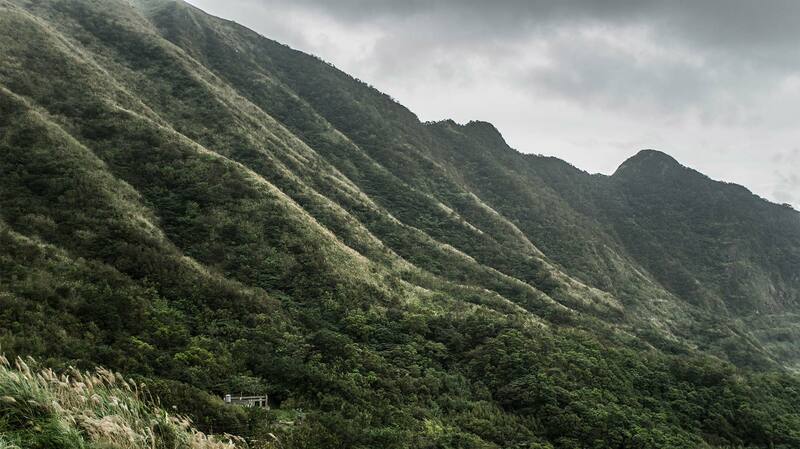 The mountains upon which the town was built. 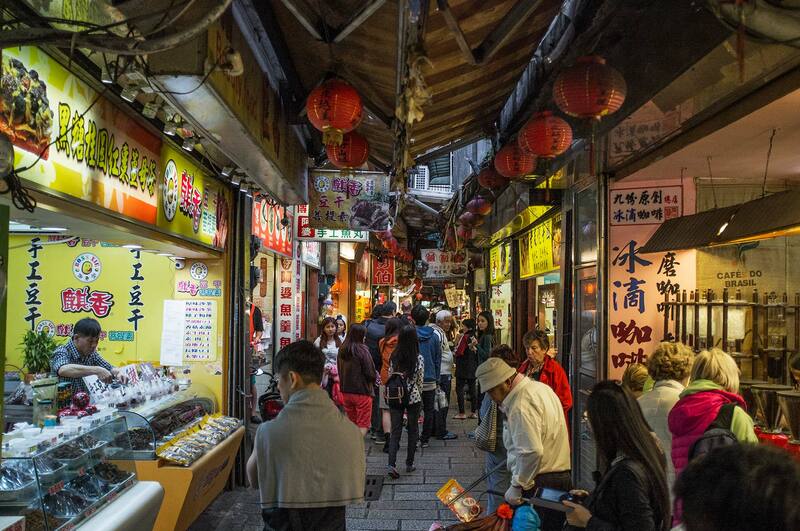 There are a few main streets that run parallel to one another, Jiufen Old Street being the most popular among visitors. The street connects ladder-like balconies, verandas, shops and houses by steep staircases that run vertically throughout the whole of Old Street. These streets are extremely narrow so the buildings are squeezed close together. In between the houses a little cave-like walkway is carved through the stone, cut off from the main road, it leads the way to a tea house. The walkway is filled with people’s names and messages scribbled in white. 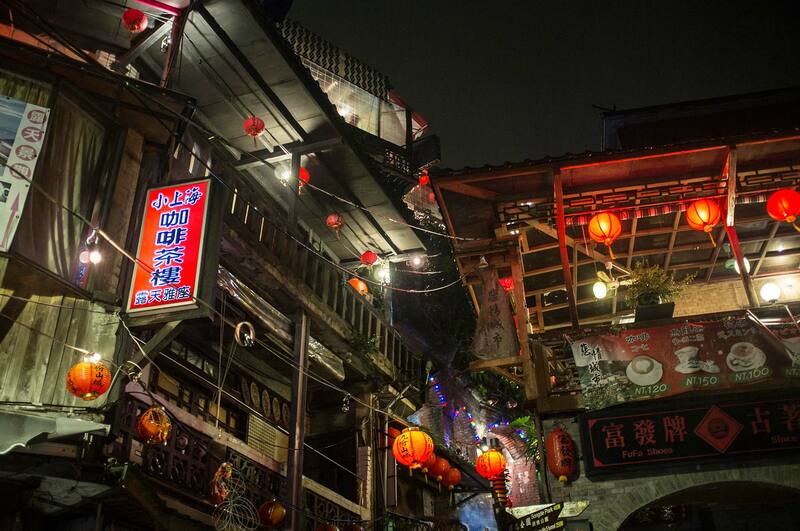 Jiufen is an isolated, mysterious, and exceptionally wonderful town, where at night the locals live with their doors open. The sounds of vendors and the smells of food being cooked spill out to fill the narrow spaces between the buildings. The roofs conceal the sky above your head and sometimes, when it rains, the rainwater runs down the folds of the rooftops, falling between the gaps. 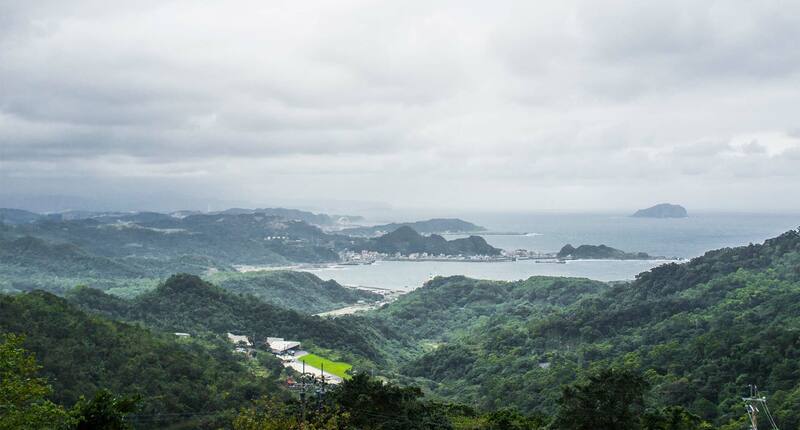 Every so often, I would catch a glimpse of the rolling mountains, covered in thick, deep-green forest, and the blue waters washing up along sandy beaches, exposed in the distance. As it’s built on a hill, when you finally reach the end of the market you are rewarded with a spectacular view of the harbour and the Pacific Ocean below. View over the harbour from Jiufen. The market sellers offer everything from traditional calligraphy brushes to food. Speaking of brushes, traditionally the Taiwanese along with the Chinese and Japanese use different types of animal hair to make calligraphy brushes, mostly using sheep’s (white) and wolf’s (brown). The process of making these brushes sees the wolf and sheep hair intertwined together, with the white woven around the black. It’s an interesting combination, considering these two are usually such contrary animals, and generally only intertwine when the sheep is in the wolf’s stomach. A local brush maker shows off her brilliant skills. She produces the brush heads only as a show for tourists. But these mixed hair calligraphy brushes are actually a special tool for those practising Sumi painting, essentially black ink painting. 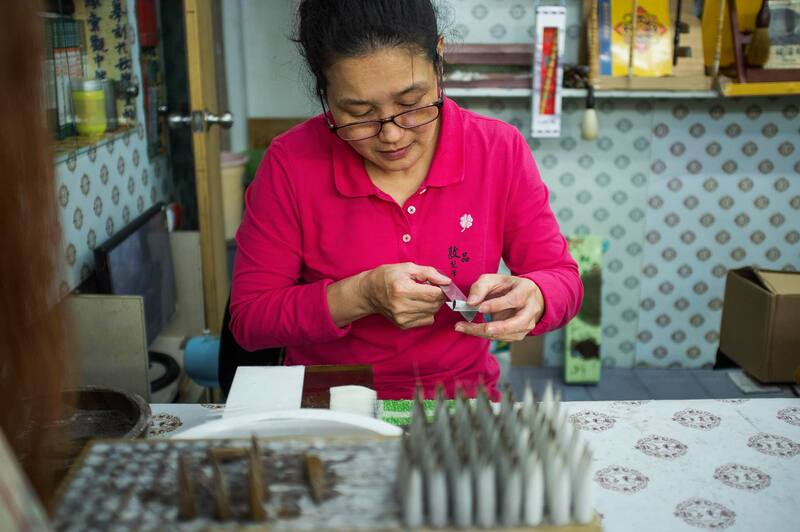 The brushes are made from different types of animal hair, again combining brown and white hairs – wolf and sheep. The stiff brown hairs of the inner core of the brush are used for their springy quality, while the outer white hairs ensure the the brush tip remains supple. 1. Other local vendors are busy with their daily routine. 2. 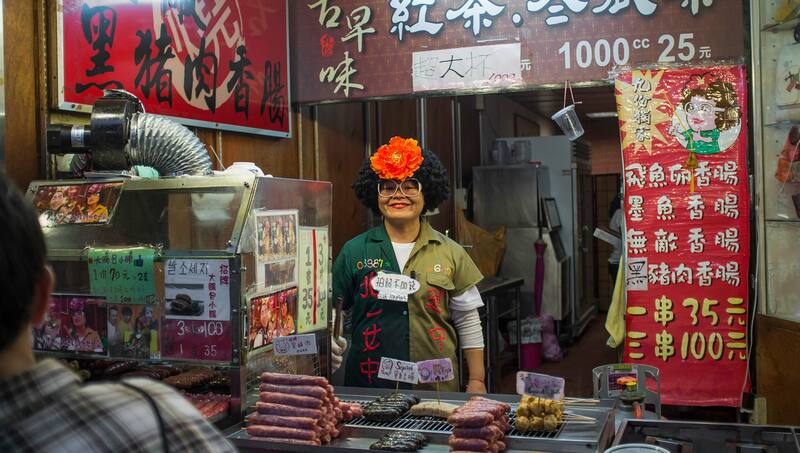 Shop owner mimics her poster – happy and playful. 3. 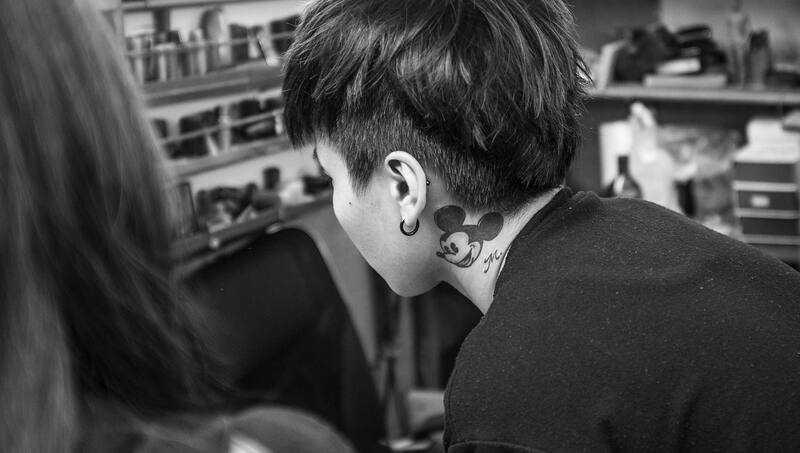 Girl with a Mickey Mouse tattoo in a photo shop. While I agree that Jiufen is beautiful, with its lines of red lanterns and curving steps, I made my way to another destination, no less attractive and of great historical importance – the old gold mining town of Jinguashi. 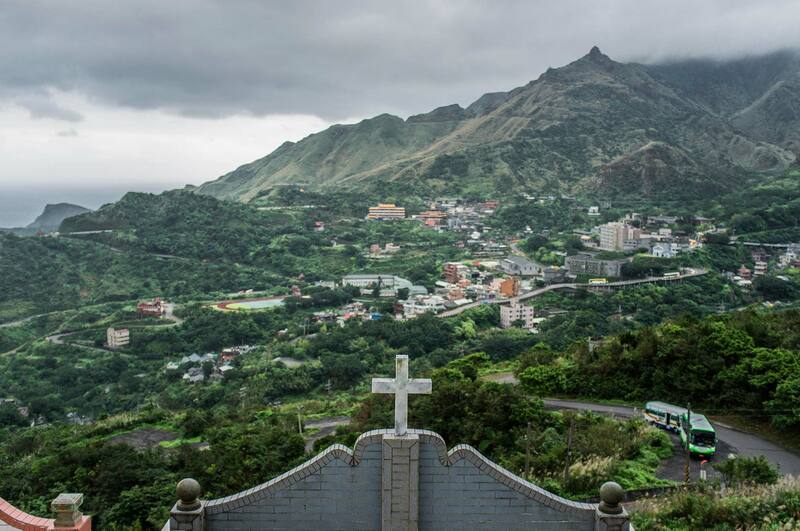 While most tourists are interested in going to Jiufen, I instead found myself surrounded by amazing landscapes filled with hills, sea views and gravestones. View from a christian tomb over the hills. These gravestones are related to Chinese culture and can be Buddhist or Christian, they are positioned on the hills because of the better view. Eventually the hills become packed with these tiny house-like-tombs, more at the bottom less at the top. This is the exact area where the mine was based, along with houses and WWII work camps. For a period during World War II this place was used as a prisoner-of-war labour camp, with captured soldiers forced to work in the mines. While there are a few statues here that feature the struggles of courageous Japanese workers, history shows that during the war many white European soldiers that were captured by the Third Reich and Japan were working here. Oops! Many Japanese traditional residential houses from that period still remain, as well as plain office blocks and factories. Today this place is a museum and small tourist attraction. What was funny to me wasn’t the controversial statues, but the restaurant located near the entrance to the site. 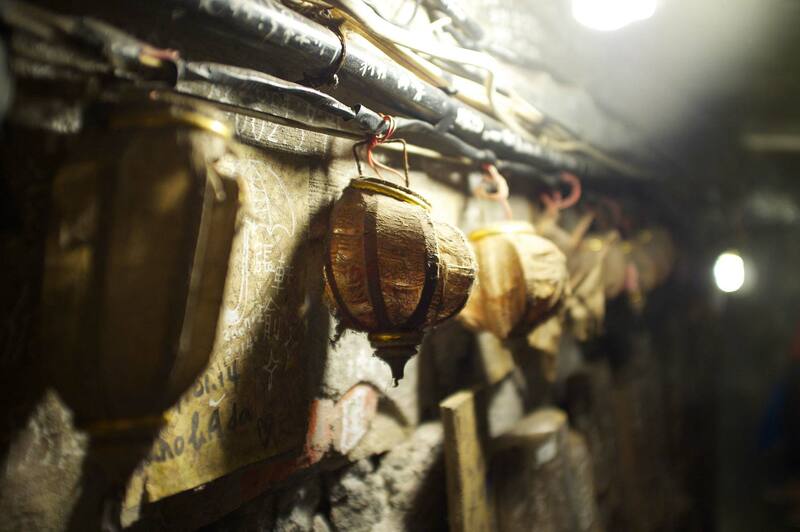 It was selling what it called a “Miner’s lunch box”, essentially the food that the hard working Japanese were eating, a chicken fillet with mushrooms and rice – sounds more like food for generals than miners. “Ahem, bollox.” Mine workers, just like, prisoners-of-war were poorly fed. It’s not a secret, but not only hard work get you a body like that of the sculpture, loads of protein is required also. Double oops! 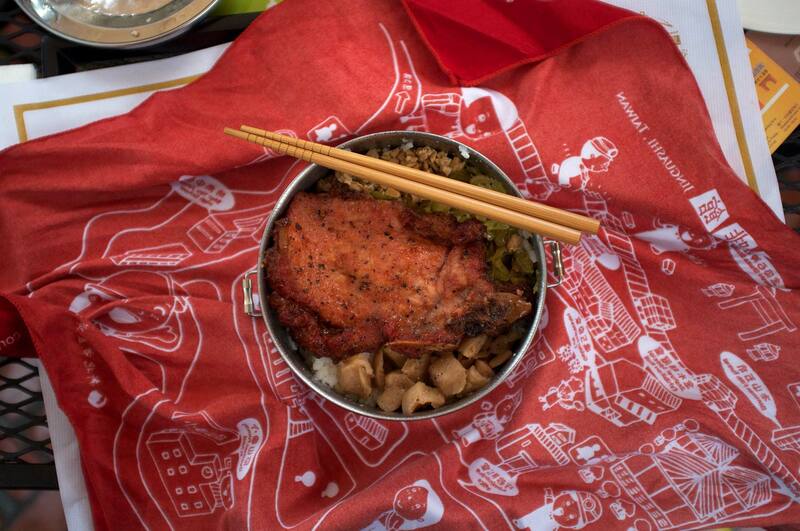 For additional money (European standards) tourists are offered the chance to buy the food in a metal tin with wooden sticks and wrapped in a red bandana decorated with comics, to get the authentic look. Great design work. At first, I kept the tin as the soap and socks holder, but later threw it away. On the way back to Taipei I stopped in Ruifang for some nice egg curd cakes and milk ice tea with jellies. Generally though, Ruifang is a very sad, small and poor suburb where there isn’t much to see or do. 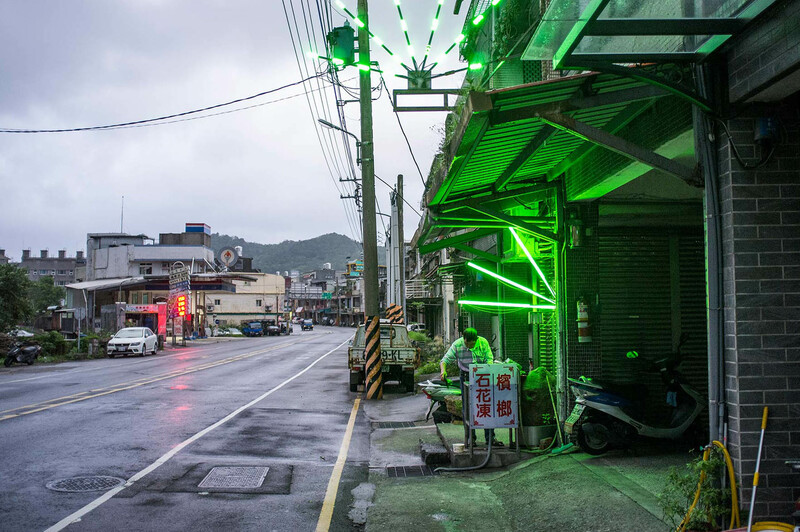 I also noticed that small towns like these in Taiwan, with housing in very poor condition, find something slightly strange appealing – light saber style lights. These are often placed on top of small food stalls and shops. I was told that they are also there to attract those who want to buy betel nut. Poor food stall owners have static lights, but in more decent areas they are animated and sometimes even multi-coloured.